I’ve been in Budapest for just over a week now, working too much, seeing too little, with sadness plaguing me. Yesterday, I escaped and explored. Sadness is an inexplicable beast. It worms its way into us without warning, without cause. As a traveller, I find myself prone to sadness and loneliness. It’s found me in nearly every city, and I suspect that’s part of the lifestyle. There’s an interminable “aloneness” in knowing I can’t ring a friend up, ask “wanna get some nachos?” and suddenly have an escape plan to distract me from the day-to-day. Escaping sadness is more complicated when alone. There are steps one can take in hopes of shaking it off, but there are no guarantees, and oftentimes such diversions can add to the sense of “aloneness”. This past week, my father was laid to rest, his ashes joining his wife’s family plot in Indiana. Of course, I wasn’t there, like I was absent for much of his past year. Discovering after the fact that he had been interred for eternity didn’t give me closure, just more regrets. 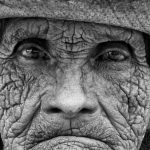 It’s a kind of permanence life can do without. There is no worst time to be grieving death than in the weeks leading to Christmas. My heart seems a little more broken with each passing day, lately. Despite that, I didn’t have time to get lost in my grief this week. Instead, I played Miss Workaholic with a freelance deadline piled on top of the rest of my work obligations. My Budapest apartment is lovely, but daylight doesn’t reach it, and winter makes the dull indoor light even more punitive. But today I decided, against my desire to hermit and hide from the world, that I’d at least take a walk. I set out just an hour before sunset. The plan? Buy milk, bread, then park myself at the neighbourhood jazz bar to write about sadness. With milk and bread bought from the market, I hit the street, and just happened to glance to the side, where sunlight glistened in a haze-shrouded street lining my working-class ‘hood. It was “the other way” from the jazz bar, so I debated the detour, looked down at my original destination, then at the light again. And so I headed toward the hazy, foggy sunshine. Next thing you know, that detour turned into another, with a right turn toward the river. There, the hazy sun was setting over the Danube River. It seemed to beckon me for at least a stroll on the bridge. Step after step, I found myself going further astray than intended. I stood awhile with trains and cars rumbling past me on that rusting utilitarian bridge. Soon, I smiled at the signs of life and leisure unfolding along the banks of the Danube, in the riverside park beneath the bridge. A number of Santa Claus-costumed walkers and joggers passed under the bridge, making me more and more curious what was afoot below, in the distance. 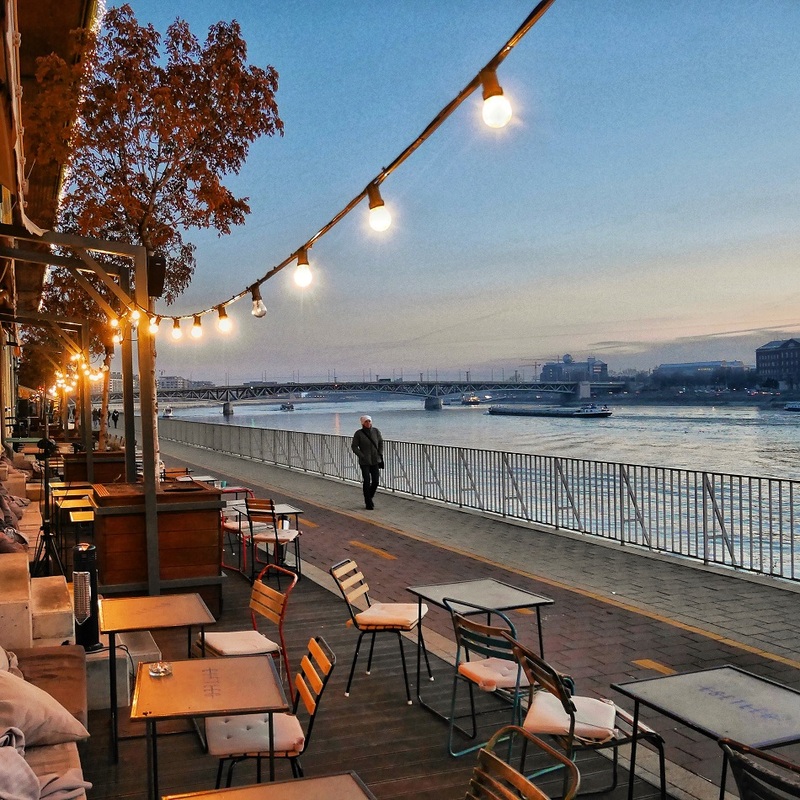 A lone stroller passes a riverside cafe at sunset on the Danube River in December. Soon, folks were passing with mugs of hot wine and dogs on leashes, as Christmas carols carried from speakers in the distance. It was a mini hub of Christmas activities. Families skated on an outdoor rink, laughing and talking, as “The 12 Days of Christmas” rang out over the stereo. Traditional langos, fried bread with cheese and sour cream, were sold among grilled sausages and other hot delights from food trucks surrounding the ice rink. Seasonal glee was the order of the day. 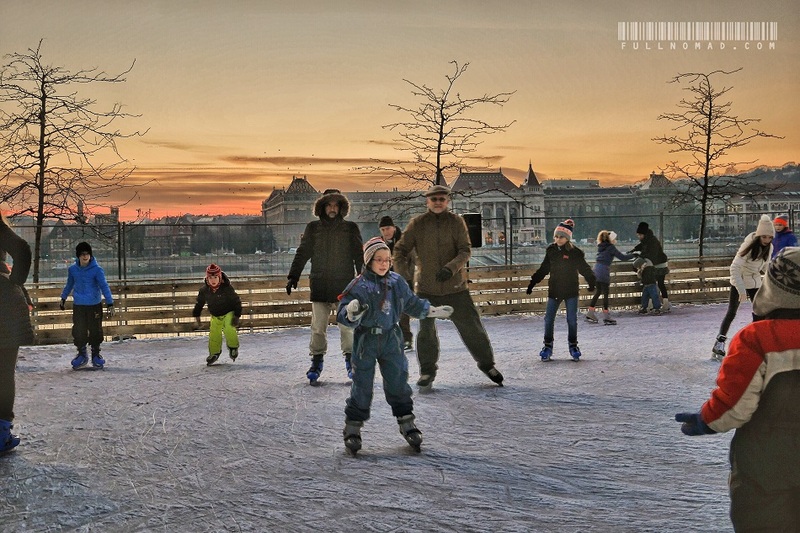 The skaters called to mind fond times of my own as a fumbling, awful skater in my youth. I remembered the one time the local pond ever froze over. With no walls to cling to, I fell repeatedly and went home black and blue. Christmas carols heralded those years past when my parents were alive and holidays held magic I had yet to experience as an adult. My mood had shifted some, but sadness still lingered. The lit interior of the building behind us stoked my curiosity again. Why not wander through the building, see what it had to offer? Soon, I’d wandered nearly three more kilometres, crossing another bridge, shooting dozens of photographs, as I enjoyed darkness enveloping the city. In the end, the sadness? Well, it’s still there. But so is faith in humanity, wonder at the ever-changing pace of life, how it never stops for any of us. And I’m glad, too, for my passion for newness, gluttony for comfort and goodness found in good drink and fine food. No matter how sad I am lately, I have so much gratitude for my courage to travel. Life is complicated, and so are we. 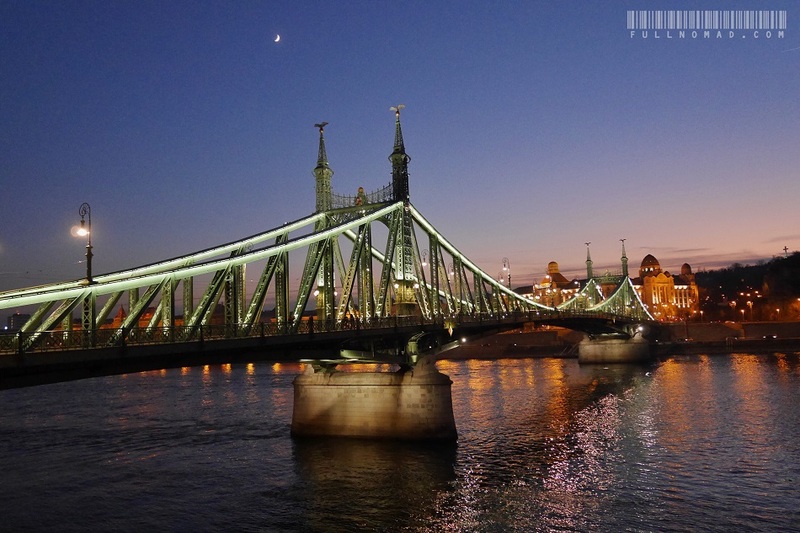 Szabadag Bridge in crosses the Danube River, shown at sunset in December. Its English name is Liberty Bridge. Budapest is complex, if you ask me. 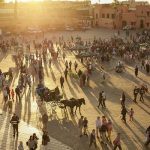 There’s obvious discontent for the struggles in the modern economy, but also satisfaction with their lifestyle and refusal to sacrifice life balance for more money. They have a slow-living sensibility that makes it easy to fall into the groove when living here. The cuisine is as tasty as anywhere else I’ve eaten so far. The wine is cheap but fantastic, apparently a secret in the wine world. Everywhere I go, I see aspects of art suggesting it’s a wonderful home for artists. Budapest seems to cater to young families, too. Increasingly, I find myself thinking I could call it home for a while. It’d be a fine place to be on a writer’s income. Now I’m nursing the end of my wine in a trendy eatery. My meal was roasted pork with braised red cabbage and plum, crispy potato slices. Dessert followed — a fresh-baked chocolate soufflé served with a ginger-coconut cream and a cappucchino. Sometimes simple nights with lovely splurges make life a delight, even alone. Dinner, dessert, a coffee, and 10 ounces of wine, all for $27 Canadian. I can live with that. But getting a reminder that life is filled with joy, activity, beauty, delicious treats, wonderful art, sunsets, and a surprise around the corner now and then? Priceless. Sadness, for some of us, is a frequent reality, but I’m glad to be reminded that I have coping mechanisms and an appreciation for joie de vivre, despite it all. Now nearly 7:00, that litre of milk bought earlier should find its way into a fridge soon. After all, I bought it 5 hours ago, thinking I’d be home in 2 hours. Here’s to looking the other way sometimes, and, even better… walking in that direction. 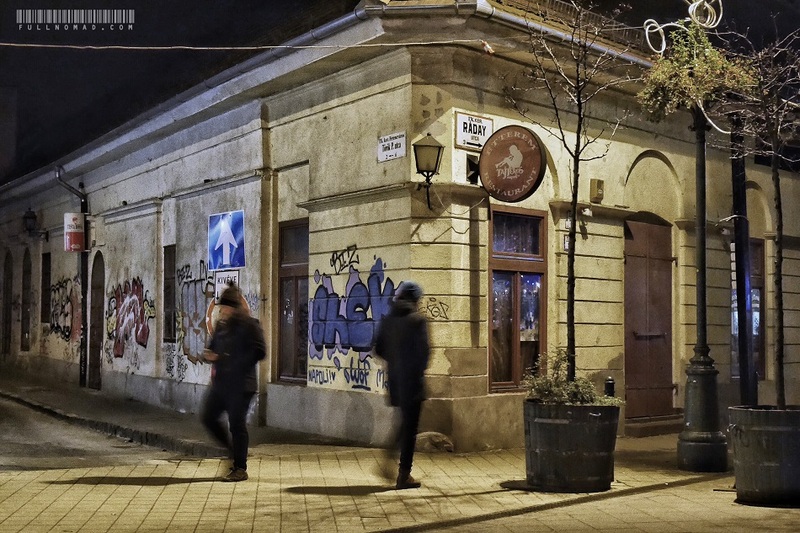 Two strangers passing in the night in Budapest, a reminder that not just nomads are alone or experiencing sadness. It’s somewhat a condition of modern urban life, too.